They were exactly what I was looking for... they match my ribbon on the tree almost perfectly. One Christmas, my man & I decided that we would ONLY buy stocking stuffers for each other & this is the stocking he bought me that year... it was full, of course. What about you? Do you and your family have a unique Tradition at Christmas? Do Share! What a great post! Beautiful faux fireplace and the stockings are wonderful. I love your tradition. 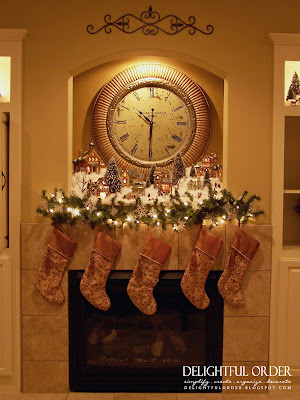 As a child our stockings (Long wool socks) were hung along a chain on the split-stone fireplace my father hand crafted. Christmas morning found them filled with fruits and nuts. Although that was years ago, it's still a fantastic memory. Haha yes, I think mama needs the BIG red stocking, it's just perfect!=) It made me chuckle! Great tradition! We do similar at Easter, but I mix it up by making it a treasure hunt. Uhhum...the "Easter Bunny" leaves a note leading them to the next clue, then the next, then the next, so on and so forth. No matter how old they get they still enjoy...the challenge just gets a little harder each year (and the bunny has to think harder and be more clever!). Here's a fun twist, one year I took a skane of different colored yarn for each child. Secretly and quietly tied one end to their bedpost, then weaved and tangled each color yarn throughout the house until I used it all up. The basket, or stocking in this case is at the end of the yarn. Catch is they have to follow the yarn's path completely, even if they can see ahead where it is. Happy holidays! You have an amazing way of organizing things! I'm currently in Czech Republic for my husband's hockey season but now I can't wait to get back home to use some of your tricks! Thank you. I totally agree...mom definitely needs the biggest stocking!! 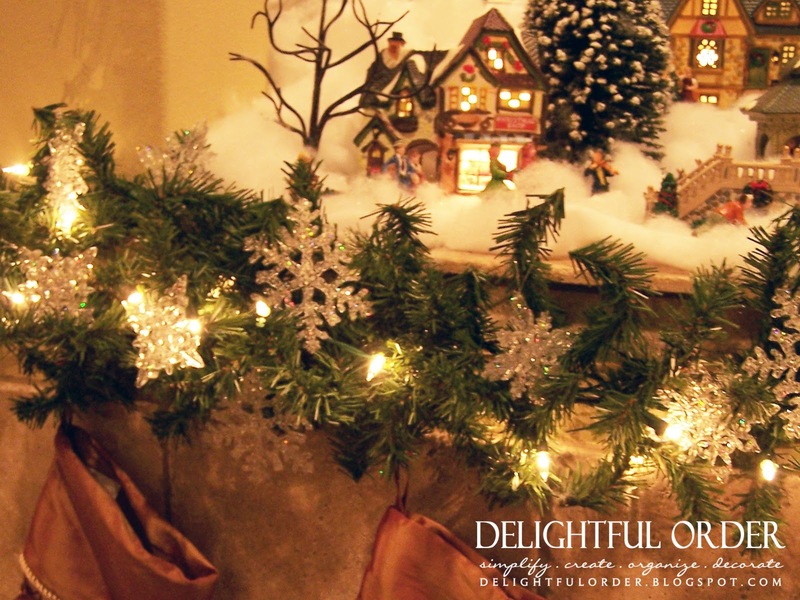 Your mantle looks so gorgeous and festive! Thanks for all your great comments. I LOVE receiving them!! SweetMelissa: Love the Easter Tradition... we may need to try that one. Thanks for sharing. how lovely! 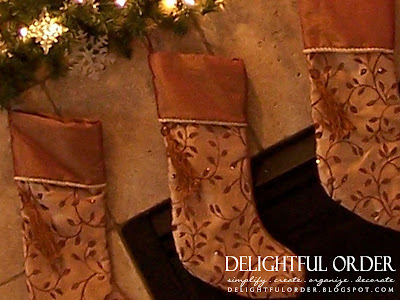 and what a great idea with the stockings! A Christmas tradition I started from the my first baby was 6 mths old is that Santa will leave them a wrapped pair of pjs to unwrap on Christmas Eve. The pjs usually get left on their bedroom door knob sometime before bed so that when it is time to get ready for bed there is a special surprise waiting for them. My now oldest baby 9 years, her brother and sister that are twins who are 5 years and the youngest sibling in the house 1 year baby boy all look forward to the new pair of pjs to wear for Christmas Eve.